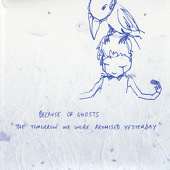 Because of Ghosts is a band on an indefinite hiatus. We’re not sure when we’ll be back. We still have music available though. "...in 2050 when we know we'll all be dead anyway"
in Montreal, featuring strings by Thierry Amar and Jessica Moss. Limited edition, live recorded tour EP. Every CD comes with unique, original, hand-drawn cover art. View all the cover art here. Upwards, Forwards, Towards the Sun! 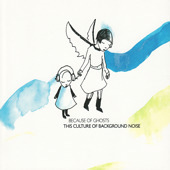 Selected recordings from 2002 to 2004. Split lathe-cut 7" with I Want a Hovercraft. Limited numbered edition of 100. Hand made cardboard covers. Limited numbered edition of 200. 12" record with an etching on side b (as described), hand sewn and screen printed cardboard cover, recorded live at the Hopetoun Hotel, Sydney. Upwards! Forwards! Towards the Sun! With hand made and sewn layered paper gatefold cover. Japanese edition, released to coincide with our 2004 Tokyo tour. With hand made gatefold cover and poster insert. Split EP with Adlerseri. Limited numbered edition of 100 with individual hand screen printed cards. Limited edition with hand sewn covers. Limited edition of 20 with screen printed sewn covers.